Here we go again! 2018, I launch into two new recording projects with my trusty engineer and musician, Phil Heaven: Into the Promise of Morning, and Singing the News. I’m celebrating 50 years as a working musician. Holding the Light, November 2017. 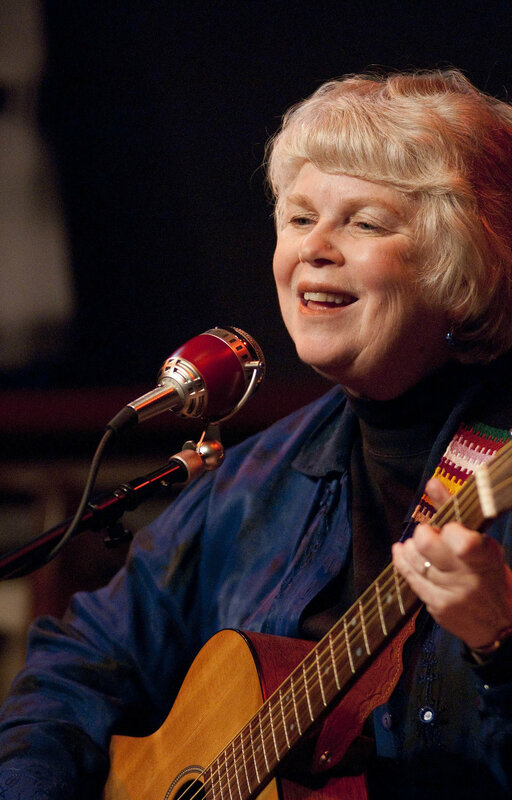 Songs and poems for the Whatcom Peace and Justice Center. Scott Slaba, Elizabeth Harris, Colleen Schwartz, and me. 2018 At the bedside with my reverie harp, working as a Clinical Musician with Hospice of the Northwest. 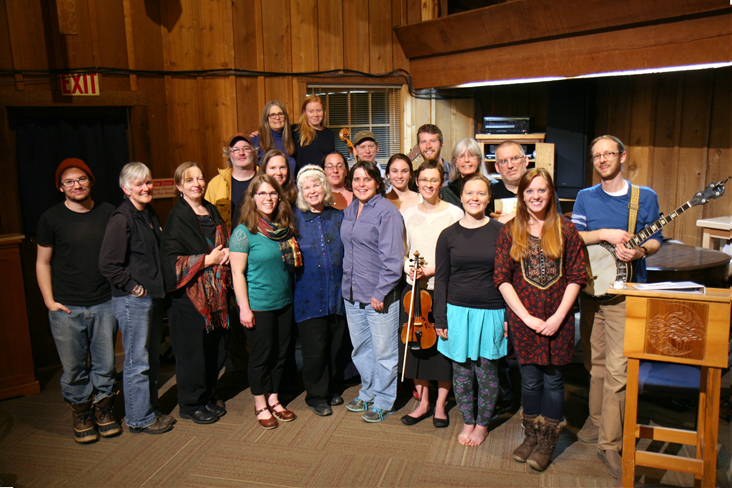 I began the Bellingham Threshold Singers in 2008, and then became a Certified Clinical Musician in 2009. The Singers go to the bedside of those who may be ill or dying. On stage at Northwest Folklife with Jennifer and Kristin. Our son Nathaniel, now a 3rd year medical school student. Daughters of Lilith, my multi-media program with new stories based on Biblical women. Original songs, puppets, dancers, images. . .so much fun! At Holden village, I organize three yearly retreats on death, grief, and the healing power of music. On staff at Holden Village, I organized two Holden Village Folk Festivals, with music, dance and art. I loved bringing work that is my passion to this remote Village community. In performance. Photo by Gary Benson. October Roses are fairest of all. At Puget Sound Guitar Workshop, singing “We Are the Rainbow Sign” with friends including Tom Rawson, Meryle Korn, Hank Payne and Ellen Van der Heuven. Daughter Kristin, in performance, 2017. Women with Wings! I founded it in 2011, to sing in facilities, day health centers, a homeless facility, in the hospital, wherever someone needs the healing gift of song. Now under the leadership of the amazing Pam Hooper and Troy Faith Ward. Holden Village cast of Daughters of Lilith, 2015. Miriam Fein and Lorraine Bayes at the Compassionate Voices retreat. With Governor Christine Gregoire, kicking off our Suffrage Centennial in 2009. With my Mom, Jean Barkley, at my induction into the Northwest Women’s Hall of Fame in 2010. Daughter Jen, singing at Glide Memorial where she is a member of the Glide Ensemble and soloist. I began singing professionally in 1969, after dropping out of teaching and moving to San Francisco. I wanted to wear flowers in my hair. Malvina Reynolds became a friend and mentor...she encouraged me to “put an edge on it”. Here we are with Larry Hanks. 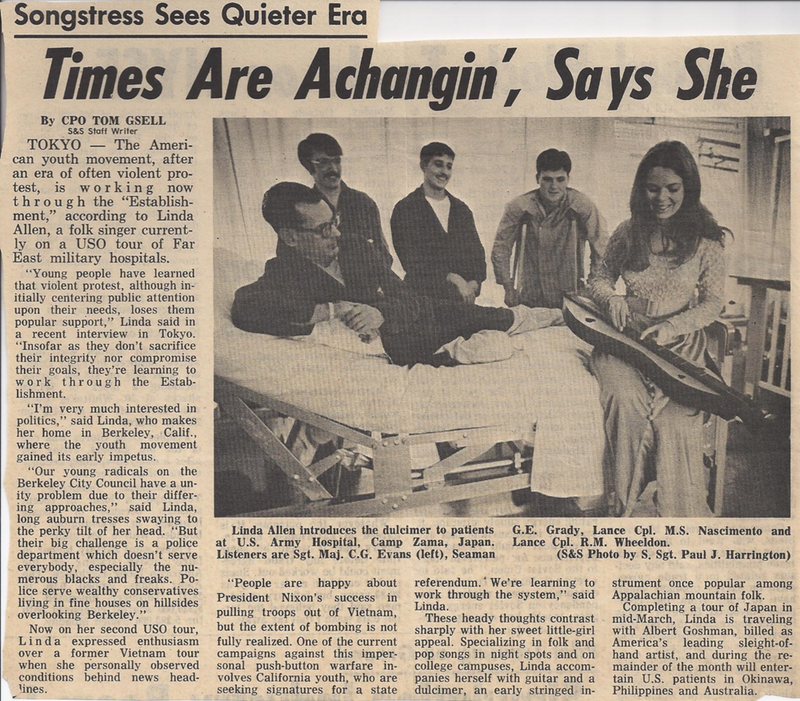 On my second tour with the USO, I sang for soldiers in hospitals in Japan and Australia. I soon found a community of people who believed in using music as a tool for transforming hearts and minds. Here I’m singing with Joan Baez at a Sanctuary Movement rally in Berkeley….one of my most thrilling moments. 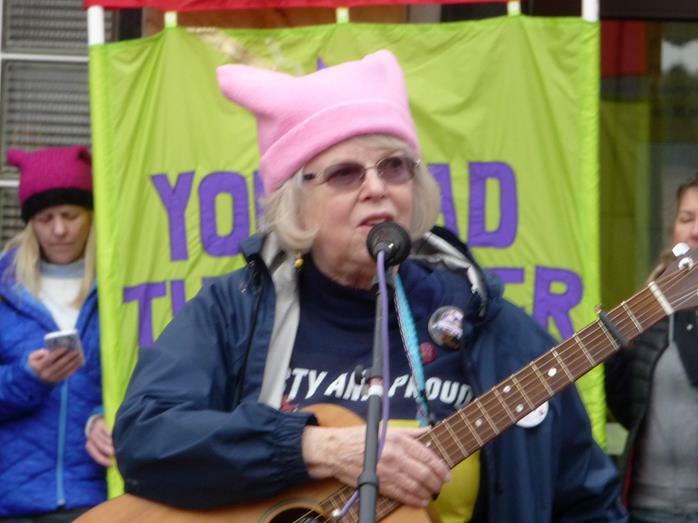 The day before leaving for a USO tour of Vietnam, I sang on the Golden Gate Bridge as part of an anti-war ritual . 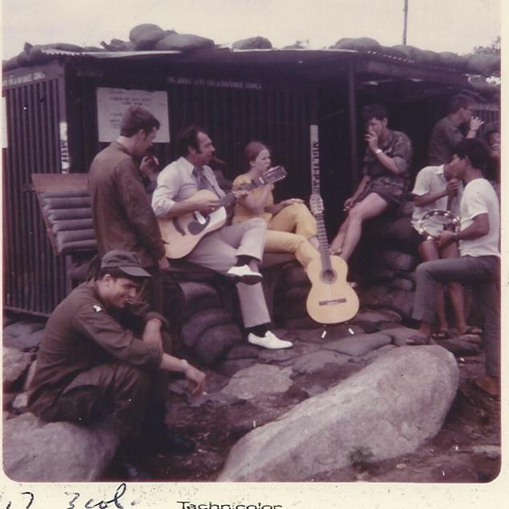 On tour in Vietnam with the USO, around 1972. I wanted to go to Vietnam to be a witness. It was a powerful, life-changing experience. I moved to Bellingham in 1976. I worked with the Whatcom Museum to collect songs about the Northwest, resulting in The Rainy Day Songbook and cassette. Laura Smith, Jim Zito and I were The Rainy Day Band, specializing in Northwest songs. Great fun! I toured throughout the State with the Washington Women’s Heritage Project, singing traditional and contemporary songs about “Women, Working and Caring”. Here I am in a promo shoot with daughters Jen and Kristin and Grandma Fran Zito. I moved back home to Washington State around 1973, and founded the Applejam Folk Center in Olympia, followed a year later by The Sunny Side Folk Center in Chehalis. There were some wonderful musicians who graced those stages . At the Northwest Folklife Festival with Jim Zito, my spouse emeritus, late 70’s. Here’s a news article from this time, with Jen and Kristin. They sometimes travelled with me around Washington as I collected songs and presented concerts. Working with the Washington Centennial Commission, collecting and recording songs for Washington Songs and Lore. About 1989. During Washington’s Centennial year of 1989, I toured the State for the Washington Resident Songwriter Project, sharing the songs I’d collected and creating new songs —eventually recorded as Washington Notebook by Victory Music. This is the promo picture I used. Later I worked with the Arts Commission collecting music of the Grange halls of Washington and creating a radio show. I did a lot of singing in the classroom with kids, touring with the Cultural Enrichment Program of the State Arts Commission, and working with the Folklife in the Schools program. I loved introducing kids to Washington history through songs! 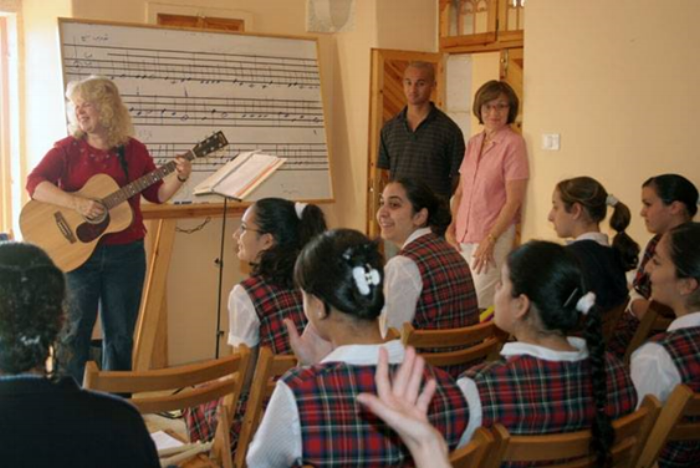 In 2006, I was invited by Dr. Sis Levin to come to Bethlehem to work with the Peacebuilders program there, teaching the kids peace songs. It was a profound experience. When I came home I created a power point/musical presentation called “Pilgrimage: Journey to the Heart of Israel and Palestine.”, in order to share my experience there. I was able to present it at many churches and other gatherings...to share a story many had never heard. I started a local chapter of Women in Black in the lead-up to the Iraq War. Later I stood with the original Women in Black in King David Square in Jerusalem. On the far right in the above photo is my dear friend and ally on many projects, Joan Muenscher. I still miss her. Marching for the ERA in Denver, about 1986. I was in Denver to sing for the National NOW Conference. Women in Black in Jerusalem. Jen and Kristin in the studio. Jen and Kristin were in the studio with me from the earliest days, eventually adding their voices to many of my songs. They are extraordinary, talented women. I am so blessed to have them as daughters! My friend, Laura Smith. I don’t think there ‘s a recording that I made that didn’t include her exquisite frailing banjo. A dear friend and musical partner. In the studio with Julian Smedley , my partner in all of my early recording projects and the Washington Grange Music Project. Wonderful teacher, friend and inspiration! Cary Black has been my rock in the studio, both as my primary bass player, and later as co-producer. Such a gifted and patient musician! Rebel Voices: Susan Lewis and Janet Stecher. They have been wonderful allies. We’ve toured together and co-created some memorable Northwest Folklife events on the Labor Stage. It was these women and Anne Feeney who convinced me to become involved with Local 1000 of the AFM. I was on the national board for three exciting years. Wonderful, grassroots organization under the leadership of John McCutcheon. Tracy Spring, Marie Eaton and I were in a group together: Women who Run With Song! Great friends and collaborators. They also lended their talents to my recordings. I love this picture of my mom and I, taken as a photo shoot for my first recording, Mama Wanted to be a Rainbow Dancer. In 2000 I began studying at the University of Creation Spirituality in Oakland. Joanna Macy was my last teacher. I graduated with my Doctor of Ministry degree and was then ordained in 2006. This was a powerful journey. ..a wonderful coming together of spirituality, art and social justice. With Peter Alsop and Holly Near at “A Gathering of Artists” on Peter’s land in Northern California. Promo photo for Where I Stand. Jen was in third grade when she wrote the article below. It’s my favorite article about my life and work.